With Christmas fast approaching, the Bangor English Drama Society took part in an annual local event which is sure to put anyone in the Christmas spirit. 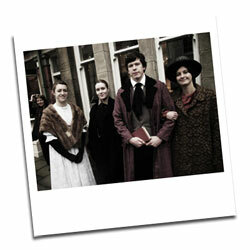 On the 24th November, BEDS became a part of the Beaumaris Victorian Christmas by donning Victorian dress and taking to the streets to perform a number of Dickensian scenes, and interact with the public in character. Local businesses and groups in Beaumaris take part every year by dressing their shop windows with traditional Victorian fair, selling crafts and old fashioned sweets on the many stalls which line the main highstreet and even setting up snow machines in their upstairs windows to shower Castle Street with a Christmas atmosphere. Even the famous Beaumaris Ice-cream Parlour got into the Christmas spirit by creating special Christmas themed ice-cream flavours and serving hot mulled wine. Despite the biting cold weather, the ice-cream proved a popular choice for visitors. The performances were a hit with visitors, especially the adaptation of Dickens’ “A Christmas Carol” that BEDS performed in the church yard. The public lapped up Dan Short’s impressive performance of the role of Scrooge, a character he managed to portray for the entire day, issuing curses of “Humbug!” at tourists. 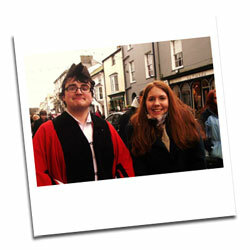 The day ended how it began, with carolling lead by the Mayor of Beaumaris himself.